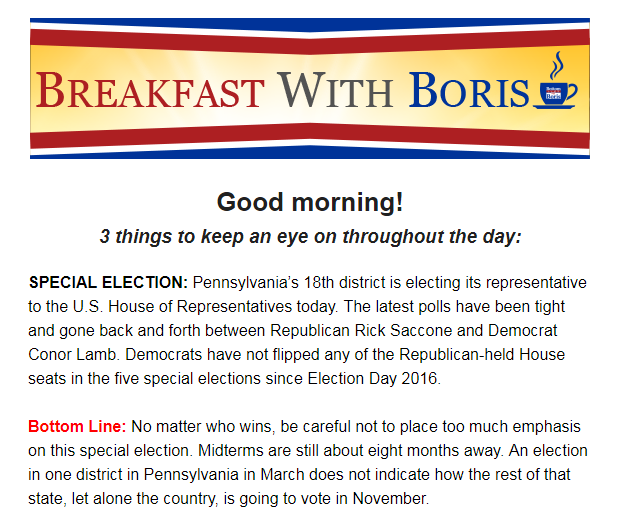 Boris Epshteyn, Sinclair Broadcast Group’s chief shill for President Donald Trump, was definitely not worried about the special election in Pennsylvania yesterday, and he is not worried now that the results remain too close to call. In the alternate universe Sinclair and Epshteyn promote to local news viewers across the country, the brewing upset is actually good for Republicans and Trump. Pennsylvania’s 18th congressional district, which voted for Trump by a 20-point margin in 2016, held a special election last night to replace former Republican Rep. Tim Murphy, who resigned last year. 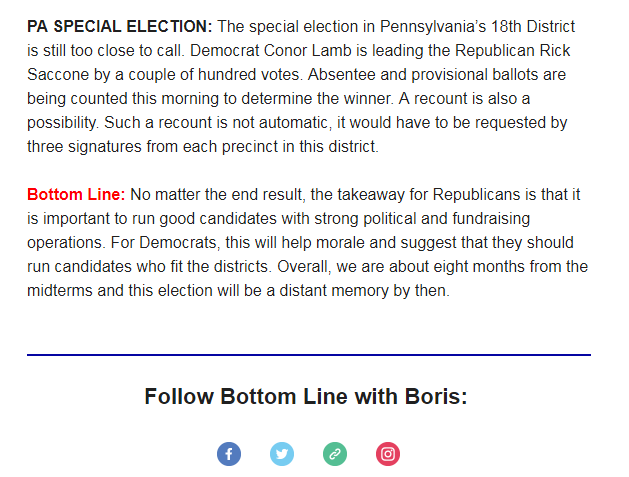 The race should have been an easy win for the GOP in a reliably red district, but as of publication, it remains officially "too close to call," with Democrat Conor Lamb leading Republican Rick Saccone by a tiny margin. But Boris Epshteyn, the No. 1 Trump propagandist at conservative local TV news giant Sinclair Broadcast Group and a former Trump aide, thinks that this outcome is somehow good for Republicans and doesn’t reflect poorly on Trump -- and he wants local news audiences to see it the same way. As the results were coming in last night, Epshteyn took to Twitter to declare the close race “already a good result for the Republican Party” and ask, “Where is that Democrat passion everyone is talking about?” His tweets quickly met the fate of many scorching takes: a high ratio of mocking replies from other users. Reality check for #PA18 - special election is being held to replace GOP Congressman who resigned amid scandal. Recent polling had Lamb up by a solid margin. This is already a good result for the Republican Party. BORIS EPSHTEYN: Saccone was down by about six points going into the final weekend. Now it’s tied. I don’t see how this is a negative for the Republicans. I see it as a positive. RODGERS: -- do you see the connection there that says maybe Trump hurt him? Or do you see it that Trump helped him with the election when we’re looking at Saccone’s votes? EPSHTEYN: Well, the president really made one true appearance where he endorsed and helped Saccone. Overall, you’re right. Saccone was down by six points, the president came in, now it’s tied. You’re seeing a Trump bump of about six points. But it’s very different from having Donald Trump on the ballot in 2016 to now having a special election where he’s not on the ballot and made one appearance. The two are not the same at all. 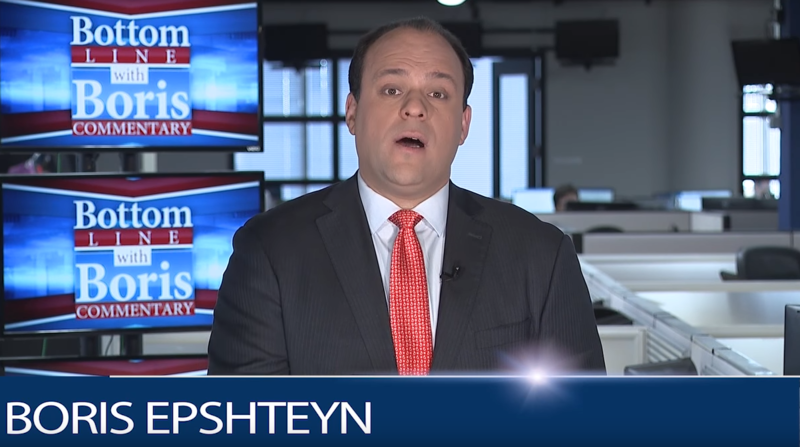 Epshteyn has now also released online a "must-run" segment focused on the Pennsylvania special election. In the clip, he argues that the race is "not necessarily" any "indication of a Democrat wave for the midterms in November," and reminds viewers that "the president was not on the ballot." Many may have missed Epshteyn’s weird, transparently pro-Trump defenses of the election outcome so far -- especially considering what little interest the public seems to have in his takes. But his latest Trump propaganda missive will be force-fed to viewers across the country now, as Sinclair mandates that all its news stations air Epshteyn’s desperate spin.